The memory system known as the Keyword Method is very effective for learning foreign languages. I've provided the following examples to help make it clear how to use this method to memorize foreign vocabulary words. Remember that when using this method or any of the image-based memory systems, you must make the effort to really visualize the images. These images are your "cues" to help retrieve the information from your memory, much like folder labels in a filing cabinet. If you don't visualize the images clearly, the cues and your retention of the information won't be as strong. Similarly, if the labels in your real filing cabinet are written lightly in pencil instead of with a dark marker they may be hard to read, making the document you want hard to find. Example 1 - French Vocabulary. In French, the word for "car" is la voiture (pronounced "la voowa-chour"). To memorize this word, we first need to think of an image to represent the sound of this French word. 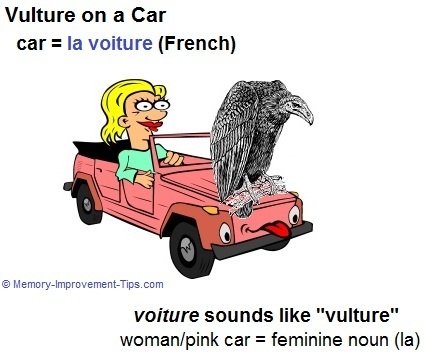 To me, "voiture" sounds like "vulture", a type of carrion bird. Remember, your subsitute word does not need to sound exactly like the word being memorized. It just needs to be close enough to remind your true memory of the actual vocabulary word. Next, we need a mental image for the car, which we will associate with a vulture. As you can see below, I've imagined a pink car being driven by a woman. That will remind me that voiture is a feminine noun that requires the article la. To associate la voiture with "car", I've imagined the giant vulture as a bizarre hood ornament on the woman's car. In your own mind, take it even further. The more unusual you make your mental images, the easier they will be to recall. For example, imagine a vulture eating a car. Or a vulture driving a car. Impossible images like that are certainly memorable! When it's time to recall the word for car, the silly image of a car associated with a vulture (as above) should pop into your mind. Instantly, the sound of the word "vulture" will remind you of voiture. And the pink car/woman reminds you that it is a feminine noun. Example 2 - Spanish Vocabulary. "Las orejas" (oh-re-ha-s) is a Spanish words for ears. To me, orejas sounds like "Oreo has". As you know, Oreos are those famous chocolate cookies with cream in the center. To remember las orejas, I need to think of an image that links Oreos to ears. Since orejas is a feminine noun, I also need to include something feminine in my image to remind me of that. As you can see, the girl literally has Oreos instead of real ears. This is a silly, impossible situation. But that's what makes it memorable! When I need to recall the word for ears in Spanish, the image of this girl with Oreo ears pops into my mind. That she has Oreo ears reminds my true memory of the root word: orejas. Because she is a girl, I am reminded that the word is feminine. 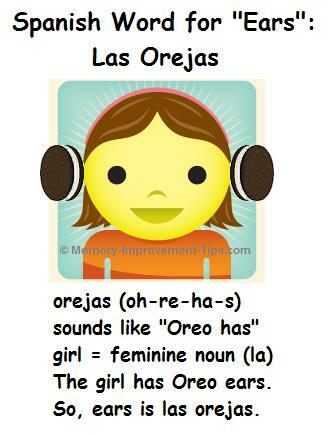 So, this funny mental image of a girl with Oreo ears reminds me that the word for ears is las orejos. See how simple and effective the image technique can be? Here's one more. 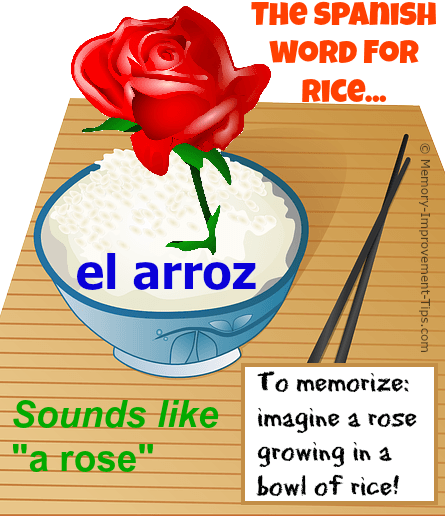 The Spanish word for rice is "el arroz." It's pronounced "a rose". To memorize this, clearly visualize the mental image of a beautiful red rose growing from a bowl of rice. Example 3 - Russian Vocabulary. The Russian word for "hi" (the informal version of hello) is privet, which is pronounced "preev-yet". Using the Keyword Method, I first notice that privet sounds to me like the English word "private". I've traveled to Russia four times, so this is a word I have used a lot. To memorize the meaning of privet I simply need to think of an image that connect "hi" with "private". The image that comes to my mind is of a Private in the army smiling and furiously waving "hi". It is critical to visualize the image in as much detail as possible - the color of his uniform, the expression on his face, and so forth. Of course, you might think of a different image. Use the image that comes to your mind most easily. It's very simple - now when I see or hear the word privet in Russian, the image of the waving Private pops into my mind and I recognize this word means "hi". To me, la plage sounds like the English word "applause". I therefore imagine a crowd of Frenchmen (berets on their heads, french fries in hand, and so on) standing on a sandy beach and clapping their hands vigorously in applause. Thinking "beach" pops the image of the French folks clapping on the beach, which is applause - therefore, la plage means beach. Again, it's pretty simple was to memorize something, but very effective. Example 5 - Italian Vocabulary. The word for "teacher" in the Italian language is insegnante (pronounced "een-sayg-nahn-tay"). By the way, I don't know Italian. Wish I did, it is a beautiful language. Insegnante is a long word consisting of several syllables. For longer vocabulary like this, we simply break down the syllables into smaller phonetic words. The word insegnante sounds a bit like "hen's egg nine tea" (say it slowly to yourself to see this). Therefore, an image we could use to memorize this word and its meaning might be a giant personified chicken egg that has a face, two legs, and nine arms. This egg-person is holding a cup of tea in each of his nine hands. He is also standing in front of a blackboard giving a lecture to a class (perhaps about the virtues of tea-drinking). Every time he waves his arms to make a point, though, the tea splashes all over. So the word "teacher" makes me think of this chicken egg teacher with his nine cups of tea -> "hen's egg nine tea" -> insegnante. A crazy image, to be sure, but very memorable! And don't worry, unless you are studying multiple languages at once, your brain will easily be able to keep the meaning straight. That is, you won't accidentally confuse insegnante for some English vocabulary word. Any foreign word can be broken down into simple phonetic sounds that you can use to create memorable images. This includes vocabulary from non-Western languages like Chinese or Arabic. This works because the Keyword method does not rely on the spelling of the word, but on the sound of the word. Try the Keyword method with the language you are trying to learn. The method and the visualization may seem odd at first, but it makes learning vocabulary a lot faster and more fun. Compare it to memorizing foreign vocabulary by repetition, and I'm sure you'll see what I mean.